How is MC Search Index working? We just set up our second Management Server next to the existing one. Search Index Service is now running on both of them. We experienced a situation where we couldn't see all of our devices in the device list (only 1.500 out of 4.500). Before this situation we shut down Management-Server 1 (for testing reasons). We then started Management-Server 1 again and 1 minute later we shut down Management-Server 2. After that the device list was not complete. Management-Server 2 had to be restarted for the device list being complete again. A forced Search-Index-Sync via console settings was not successful before. I think this behavior has something to do with the way the Search Indexes are working and communicating with each other. 1) Does anybody know how the sync is working? 2) What happens when we shut down one Management-Server? 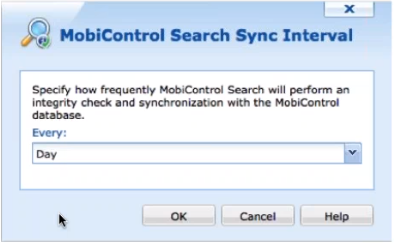 What do you currently have your MobiControl Search Sync Interval set to? I can imagine you are shutting the MS's down to ensure there is redundancy for disaster recovery purposes? However if the frequency is set to 1 day for example, would it have had enough time to synchronize with the DB and Index? 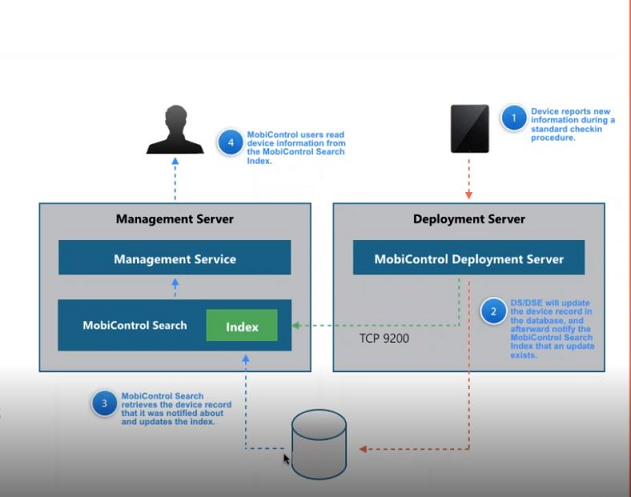 1) I am including a diagram of how the search service communicates, hopefully that may help you understand it better. 2)As far at to what happens when you shut down 1 Management Service, I would assume that the other MS continues to provide updates from the DB at the same scheduled time. I am reaching out to the SME for the Search Index for more information but in the meantime hopefully this diagram may help you some. First of all: Thank you for your reply. I think it is now clearer for me to understand the concept of the Search Index. The problem we ran into (not all devices visible) may have its cause in the fact that the second Management Server was freshly installed and didn't run its Search Index Sync completely at this time. That's what I believe the experiences you are having are attributed to. How to AUTHORIZE a unique WIFI acces point ?